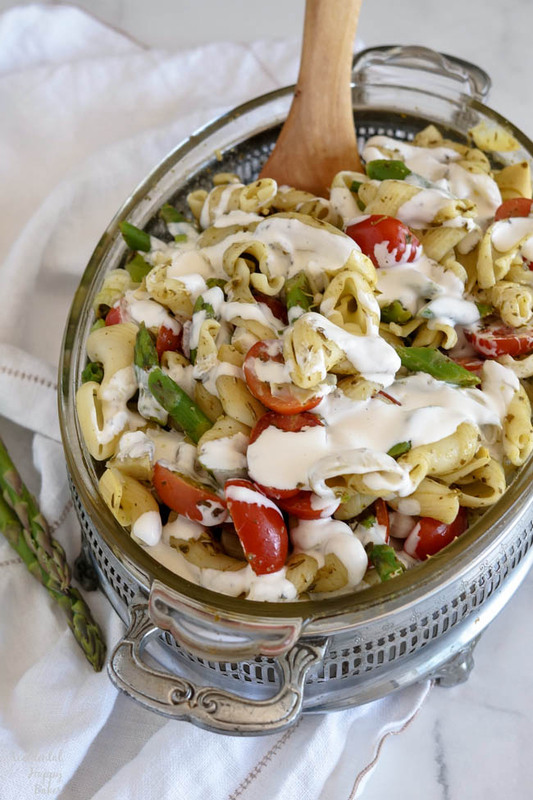 Creamy pesto pasta salad is an easy make ahead salad full of fresh spring vegetables like asparagus, cherry tomatoes, artichokes and is topped with a creamy homemade dressing. In case you weren’t aware we’re in asparagus season now. Asparagus is one of my favorite vegetables, it’s usually a bit pricey, but right now you’ll find it at it’s best! If you’ve never bought fresh asparagus before, you might be a bit intimidated by this vegetable. It kind of has a reputation of being finnicky, but it’s very easy to select fresh asparagus. How to choose fresh asparagus. Pick asparagus that are firm and stand tall. You don’t want shrively or slumping asparagus.This means the asparagus is old. Check the tips. They should have closed buds, not open or seedy buds. Check the bunch. It’s best to get asparagus that are similar in thickness so they cook evenly. Smell it. Fresh asparagus shouldn’t have an odor. Gently apply pressure to the end of the stalk. It will naturally snap off towards where the woody part of the stalk ends. That’s it! 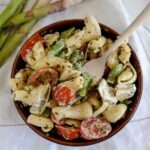 If you’ve got that down you’ve mastered the hardest part of making this creamy pesto pasta salad. 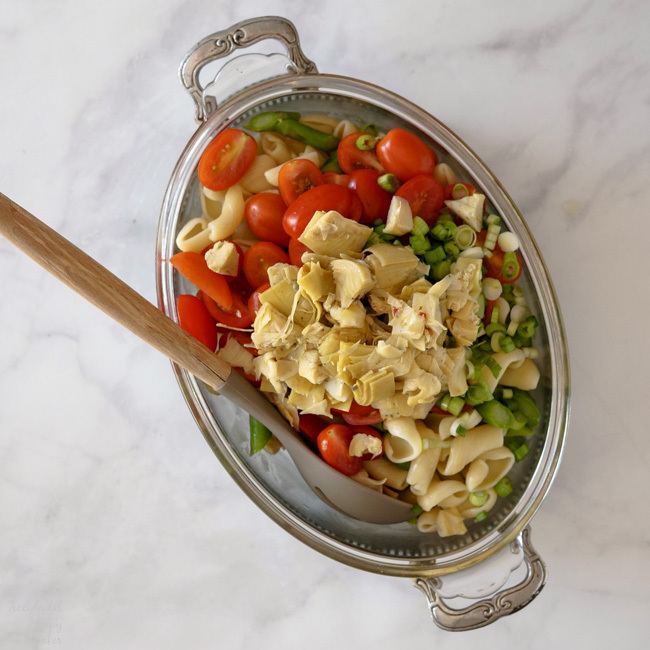 For this pasta salad I recommend a pasta shape that’s easy to get on your fork, like rotini, bowties or shells. I used some funky trumpet shaped pasta I picked up the other day at Walmart. 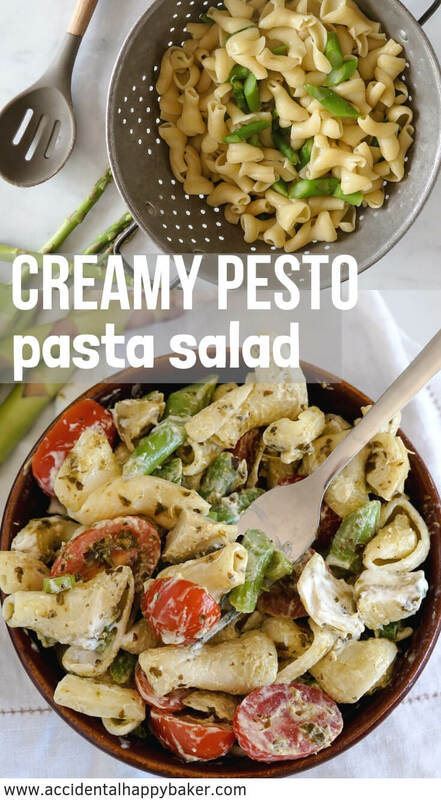 You can make creamy pesto pasta salad with homemade pesto or with store bought pesto. 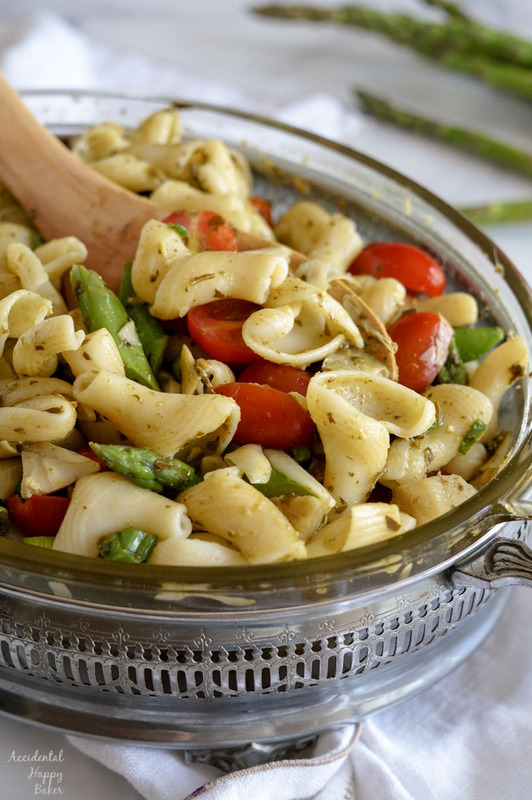 One of the things I love about this pasta salad is that the pesto is added before the dressing. 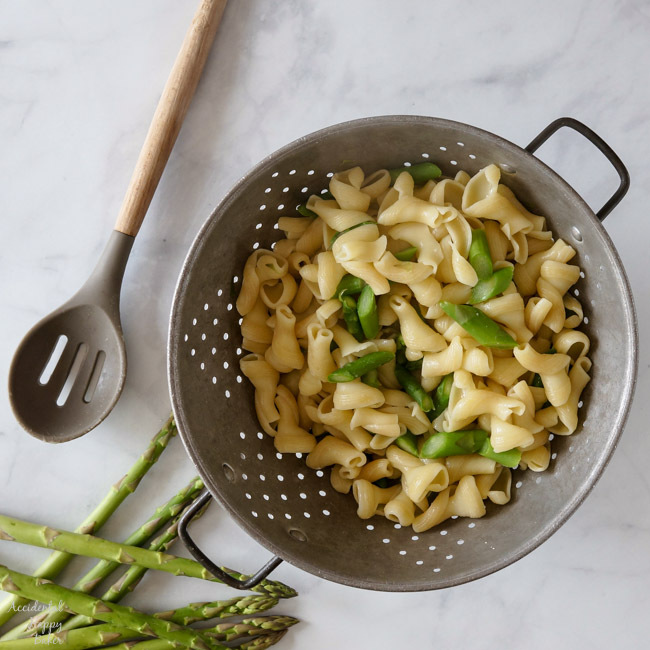 Pesto adds enough moisture to the pasta to keep it from sticking together, but then the dressing is added right before serving, so you don’t get that dryness that sometimes happens from the pasta soaking up all the dressing while it sits. This salad can be made the day before, just add the dressing when it’s time to serve. Wanna make it a main dish? Try adding some grilled chicken or shrimp. I don’t have it my photos for today because it’s bright blue and green, but I love my over the sink colander for when I’m making pasta and highly recommend it if you don’t have one! It’s so darn handy. Bring a large stock pot of salted water to a boil. Add the pasta. 3-4 minutes before the pasta finished cooking, add the asparagus to the boiling water. Drain the cooked pasta and asparagus and rinse with cold water. 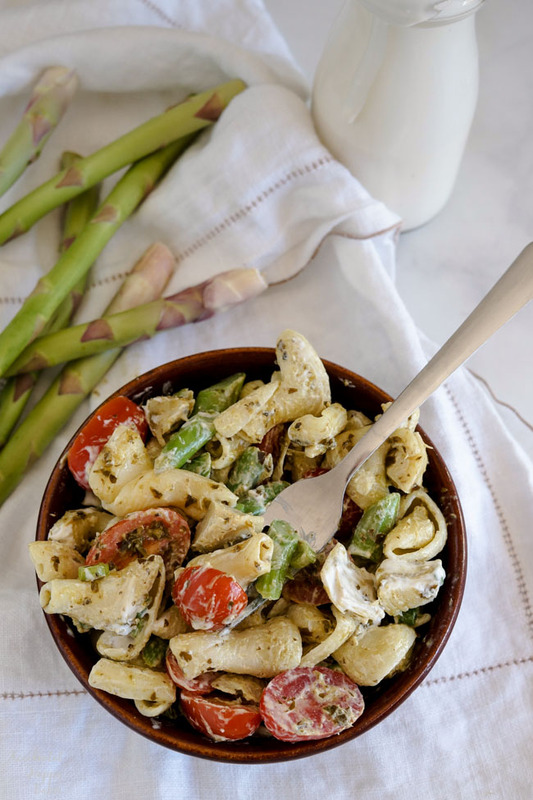 Combine the pasta, asparagus, tomatoes, artichokes, and green onions with the pesto. Refrigerate until time to serve. In a small bowl, whisk together the mayo, sour cream, buttermilk and vinegar. Just before serving toss the pasta salad with the dressing and season with salt and pepper to taste. Can be made 1-2 days in advance..
Love the ease of pasta salads? 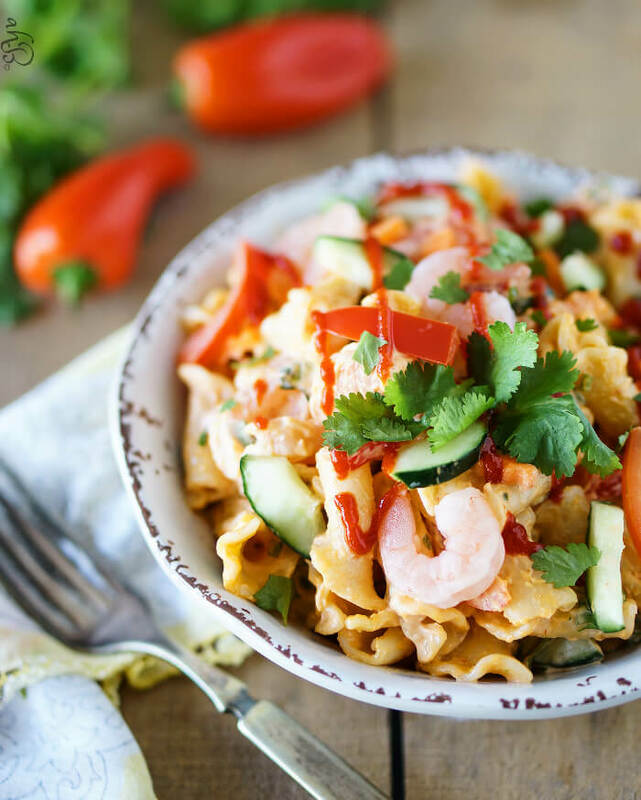 Don’t miss this Sriracha Shrimp Pasta Salad.